…seem, increasingly, a contradiction in terms. See this image, from The Sun via Fox News, below. The girl pictured has a laryngeal cleft, a hole between her larynx and her esophagus, which means she can’t eat normally; food or drink can pass into her airway. The tube through her nose passes down her esophagus, bypassing that hole; it’s the only way she can take sustenance. The girl’s mother tried to post the image on Facebook, not to garner sympathy, but to raise general awareness of the hassles and hazards of laryngeal clefts, and to raise money for her daughter’s necessary surgery. contains shocking, sensational or excessively violent content. This type of material creates an unexpected experience for users, and goes against our core value of fostering a positive global community. 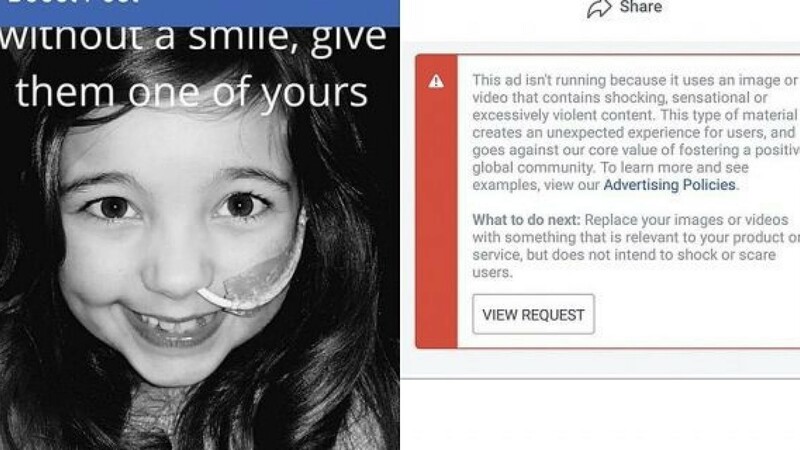 Because a smiling little girl, albeit with a tube in her nose, is shocking, sensational, or excessively violent. Because Facebook has such contempt for its users that it considers them such snowflakes that unexpected experiences—surprises—would excessively disturb them. Because Facebook’s view of positivity overtly excludes attempts to bring those apparent snowflakes’ attention to an uncommon medical condition so that that attention might foster increased medical research into ways of alleviating or correcting such a condition. The mother successfully appealed the bar, but questions remain: with this sort of ban being Facebook’s kneejerk, initial action, how can Facebook be taken seriously? How can Facebook’s management be trusted? This entry was posted in culture, morality, politics, regulation and tagged culture, morality, politics, regulation, responsibilities by eehines. Bookmark the permalink. This is a mild example of the failure that is censorship.